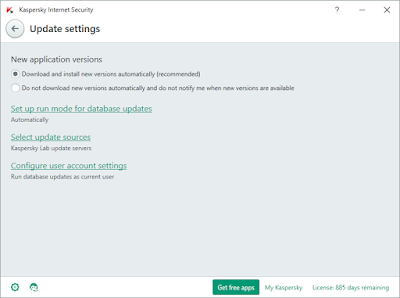 By very obviously omitting the option to notify me when a new version is available but don't automatically download or install it, KIS gives users the choice between a very bad option [do not notify and do not download/install automatically] and an option that is relatively less bad for the users but gives away control to Kaspersky. Users will thus be forced to choose the less bad option, since the logical/obvious third option has purposely not been provided by Kaspersky [in order to force/nudge users to the less bad option]. The idea is that if you want to be notified of a new version, you must also download and install it automatically, a sort of a rider.